Well, I started this project about a year ago. I titled it "on a budget" for specific reasons. Everything pictured in this thread was done solely by myself and the occasional help from a friend here and there. I learned how to weld and do paint/body work during this process. Im not an expert in no way but it works for me. I have been wanting a turbo car since I was younger. Being on this site made me feel like a wannabe since its "Turbo"bricks. Due to people's knowledge and drive for learning and sharing information, I was able to learn how to do what I have accomplished. I am not finished with this particular project but maybe with some comments from you guys, I will get motivated even more to finish. Being one of the only modified brick owners where I live, it gets hard to be motivated. So here is what I have: A 91 245 NA B230. I am doing the +T on it and some other things. Goal is to make 300whp which I believe is almost there. I was overall impressed with the turn out. I mean come on, people pay top dollar for something like this... Being that its an engine bay, I wasnt too concerned on how it would turn out. In my case, I came out on top. Looks good. So if you ever need to service anything on that harness all you have to do is take apart the front of your car? Last edited by MrBrown; 02-23-2015 at 10:25 PM.. Thought about that. Only the driver fender. I can deal with that in return for knowing where exactly my issues would lie since I rewired it to my liking. I could also go at it by removing the wheel mud guard, no biggie but I see what your saying. Any ways.. I am prepared to hear the "why's" or the "I would not have done that" and I can only say that I am learning and I have researched as much as I could on certain things and then there is trial and error. Thats why this is a project and it is supposed to be fun right? So..
Im happy with it and its finally coming together! Polishing aluminum is a royal PIA. Nice work, it's coming together very nicely. Should look fantastic when done. For learning how to do a lot of this for the the first time your work is top notch. Great job so far. Those ic pipes look wonderful in there. Damn. Seriously, that's pretty sweet lookin. I really like the engine bay color. What is it? Wow! Very nice work, looking great! So. I bought this bag a$$ intercooler which is 31x12x3 and came with 3" piping and hoses to also include torque clamps. Some may be saying why or thats overkill but my title says budget. I bought this kit brand new for a mere $80. online so I figured why not make it fit. With some massaging, and a harbor freight cheapo grinder, its on like donkey kong!! Very nice project. 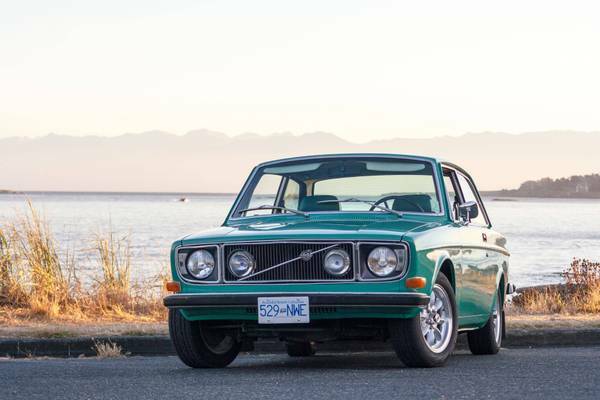 The color under the hood looks a lot like the color volvo used in the '70's on the 140. "On a budget" sounds cheap, but the pictures show a very nice project! That is a wonderful build so far. Way better than I could ever hope to do. Don't worry, those pictures look like the hose is close to the cut out and could shred open those hoses!! But its an optical illusion. They are a good way aways from touching. Plus this intercooler is mounted solid and does not move which you will see soon. That would make sense since the color is from vintage vw's. colors back then were sweet IMO. I am not too big on metallics and pearls. Straight colors are where its at. Thanks again for the compliments. This is working on helping me get back to it. You would be surprised to see what you can do. Just have to try. With that being said, I will never be as good a welder/fabricator as Nathaninwa, Ben Kaplan or as smart as John the outside agitator to name a few that inspire me, but I can learn from them and attempt to do the things they do. Gotta start somewhere right?